The stackable planter is great for growing strawberries, herbs, succulents, flowers, and more in a small amount of space! The planter design has water reservoirs on each layer. With this planter you will not need to worry about over-watering your plants. Truly Gardening Made Easy! Can also be used for hydorponics, just ask us how 🙂 The contents include 5 stackers, 20 planting locations, & 1 bottom drip tray . - Patented Flow Through Design - Save Water - Save Space - Grow More Effieciently. - Made of Food Safe Polypropylene - Just Need To Water Top Pot. - Great For Growing Strawberries, Herbs, Flowers, Succulents, and Much More. 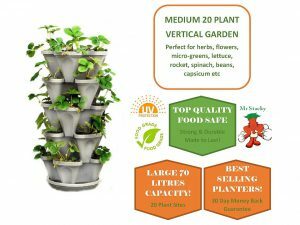 - 5 Mr Stacky Planters Plus Bottom Saucer - W:12 x 12 x 28 V: 25 Quarts. - Gardening Made Easy! Ideal Gift Too - Made in USA.